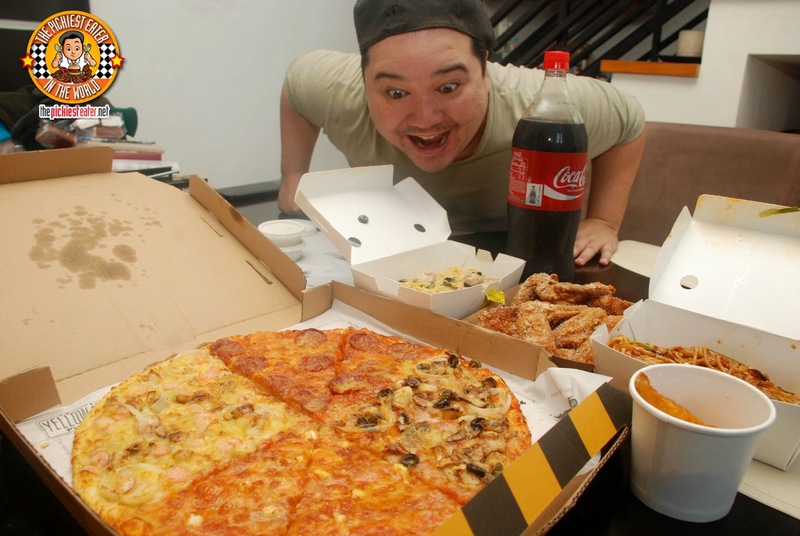 THE PICKIEST EATER IN THE WORLD: DECK THE HALLS WITH YELLOW CAB PIZZA CO'S CHRISTMAS FLEET! 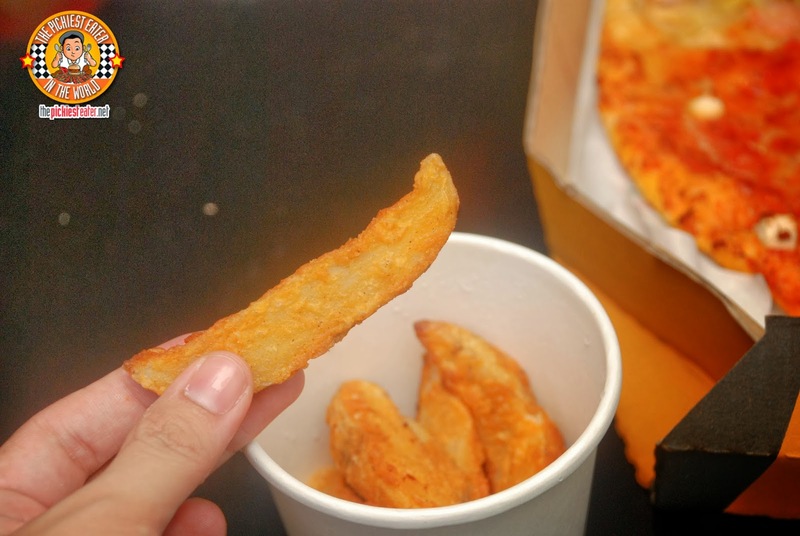 You start you off with the Jalapeno Wedges, with gives you a spicy kick with every bite of your golden fried potatoes. And then you make your way to the box of 6pc Garlic Parmesan Wings. I'm not sure where Yellow Cab chickens go to the gym, but dang are they HUGE. 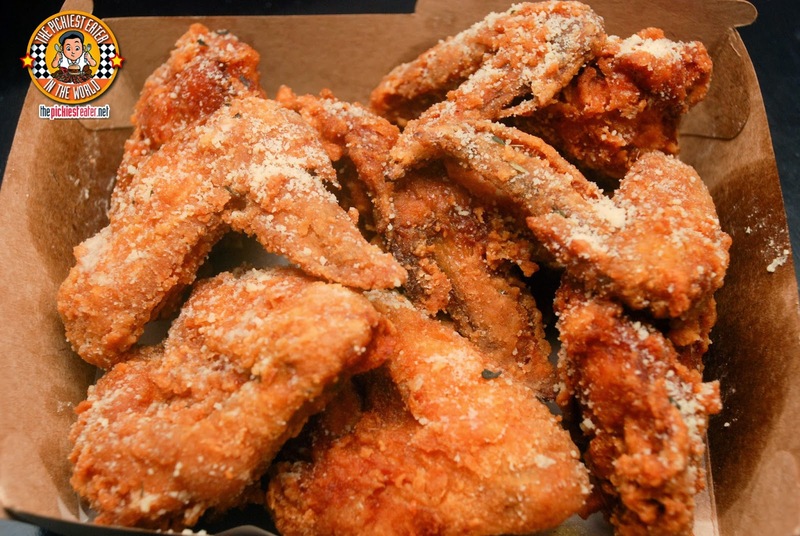 The wings are coated in a light garlicky batter, deep fried, then dusted with a bit of Parmesan. Very flavorful and juicy! The Christmas fleet also includes two orders of Pasta of your choice, which includes the Chicken Alfredo - a light, cream based pasta with chunks of chicken and a bit of olives. Quite delicious. I'm going to go say it. 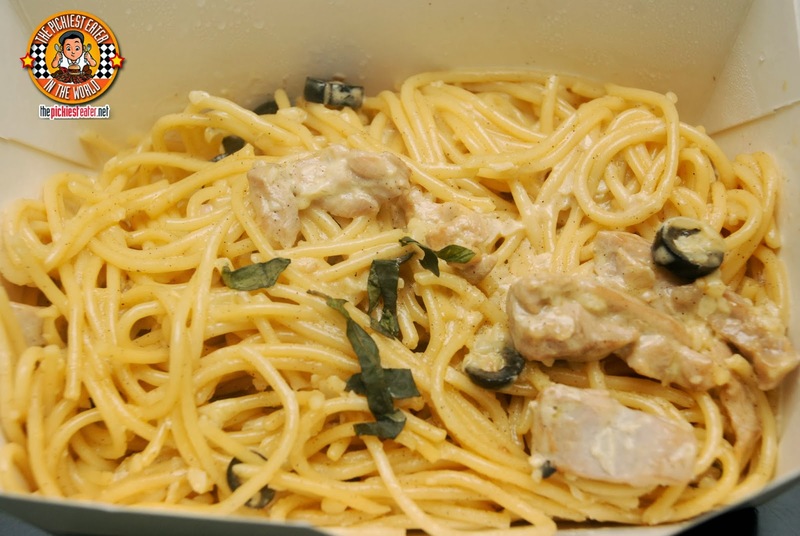 When it comes to pasta from all the Pizza joints out there, Yellow Cab's Charlie Chan Chicken Pasta is THE BEST. The chili and sheer oiliness of this dish causes an acid attack in me, but I don't care. It belongs on my list of "One Of The Best Things EVER". It's sweet and spicy at the same time.. Even without the meat, I could eat a bucket of noodles bathed in their Asian Sauce. The only thing I would change about this, would be to remove the peanuts. And Finally, the crown jewel of Yellow Cab's Christmas fleet is their Large Pizza that comes with it. You could choose a Four Seasons variant which is a combination of four flavors, New York Classic (Pepperoni), 4 Cheese, Roasted Garlic and Shrimp, and Anchovy Lovers. The next time I order this, I'll be ordering the Manhattan Meat Lovers.. to me that still rules all hehe. The fleet also comes with a pitcher of coke, or 1.5 Bottle if ordering delivery. For how much you ask? 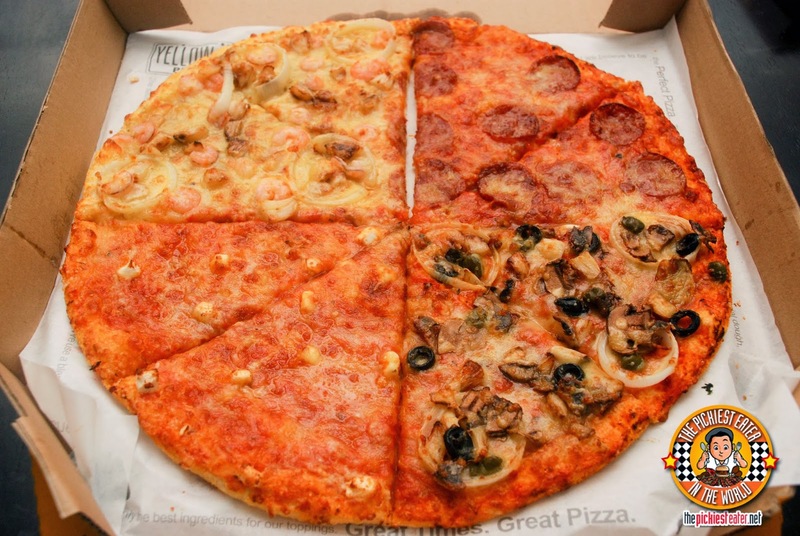 Only P1,600! Not a bad considering it could feed up to six people (Fine, If i'm included, safer to make that four!)! 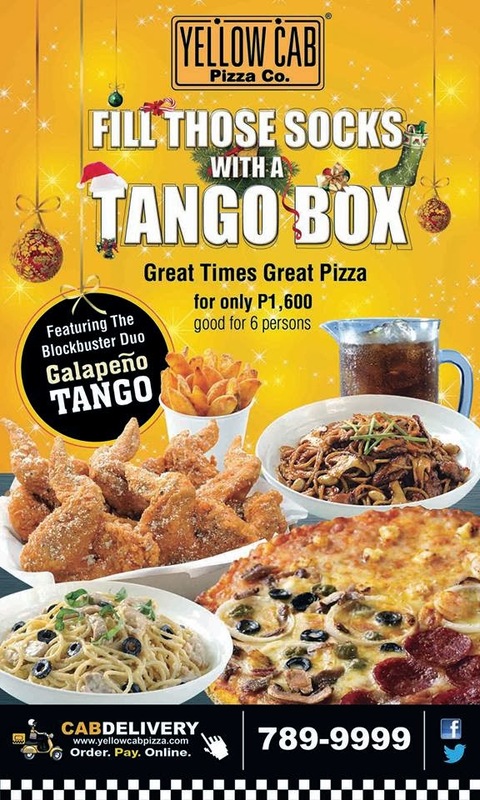 That would come out to less than P270 per person for all of this! Awesome Stuff, Yellow Cab! Definitely Great times, Great Pizza! Great blog Richie! Thank you for sharing and we hope you enjoyed our Christmas Fleet! Ooooo! I gotta try this when I go back to the Philippines! You definitely have to Naddy! Oh wow! Perfect for Christmas parties!!! Great Minds, Joei! Hehe.. When do I get to meet you?? 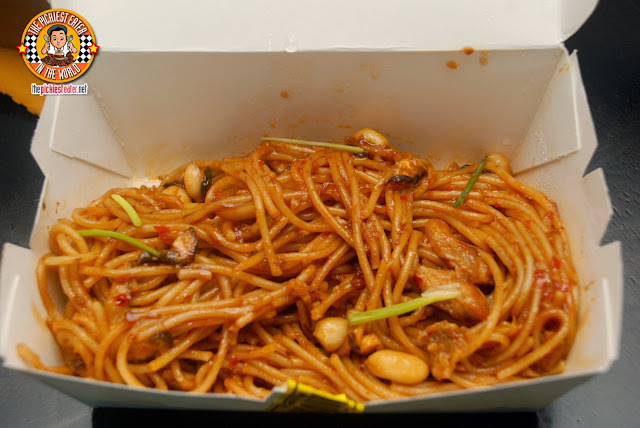 PS: I love the peanuts in Charlie Chan... I'll go on a strike if they decide to take it out! No bueno! 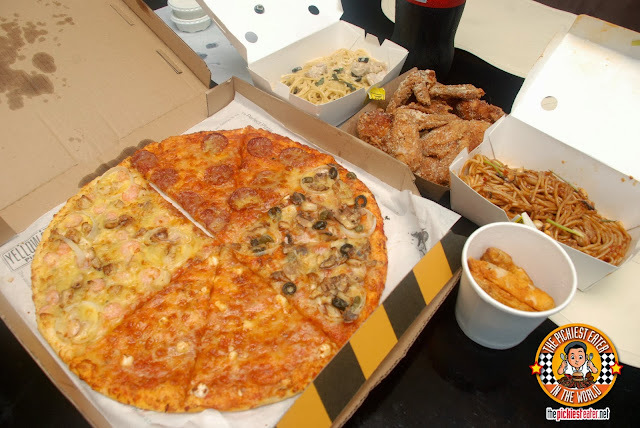 Haha if ever we food trip together at Yellow Cab, I'll make sure to give you all my peanuts!